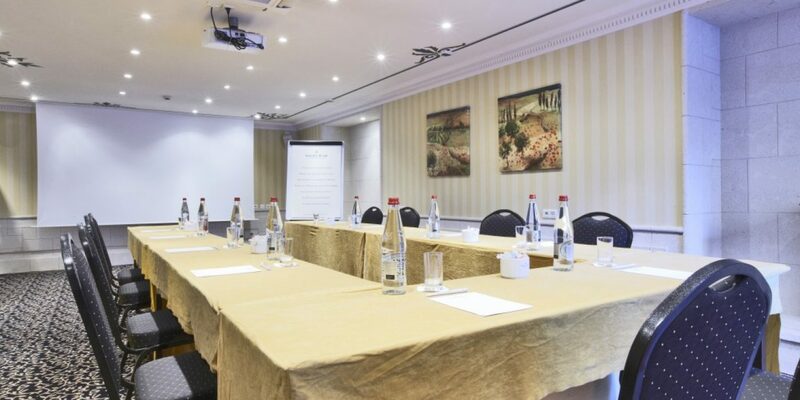 standard-title Meeting Rooms Meeting Rooms The Hotel de Paris 4 * Cannes offers 2 large conference rooms for events and other business seminars. Our living rooms on the ground floor offer direct access to the terrace and the swimming pool for personalized breaks. Our rooms benefit from a completely natural light, in a very elegant decor. They are equipped with a Highspeed Wifi internet access with a wall-mounted screen, a video projector and a sound system with 3 HF microphones (extra cost). Lunch can be served buffet-style in our "Lerins" and / or "Esterel" lounges or on our sunny terrace. 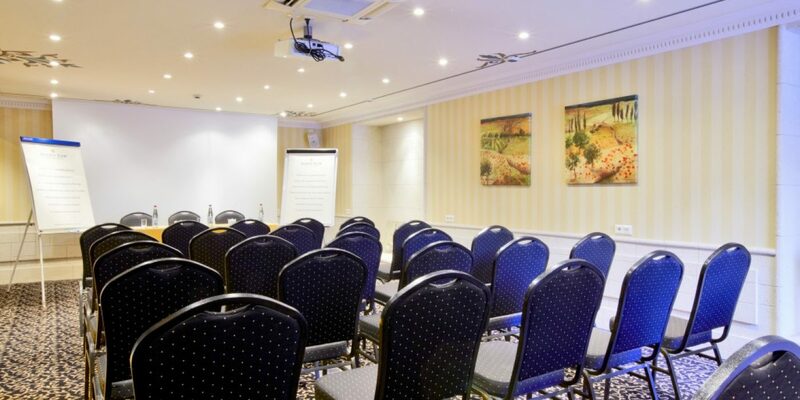 U shaped conference room : Conference room – scholar / Conference room – Theater / Conference room – Free Highspeed Wifi Internet. 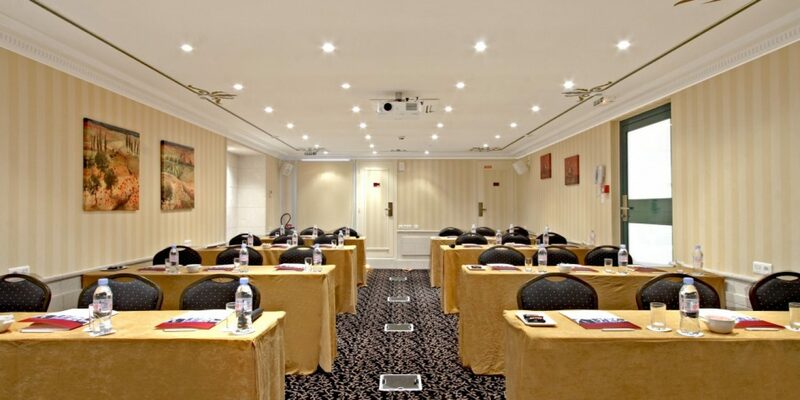 Meeting Rooms The Hotel de Paris 4 * Cannes offers 2 large conference rooms for events and other business seminars. Our living rooms on the ground floor offer direct access to the terrace and the swimming pool for personalized breaks. Our rooms benefit from a completely natural light, in a very elegant decor. They are equipped with a Highspeed Wifi internet access with a wall-mounted screen, a video projector and a sound system with 3 HF microphones (extra cost). Lunch can be served buffet-style in our "Lerins" and / or "Esterel" lounges or on our sunny terrace. 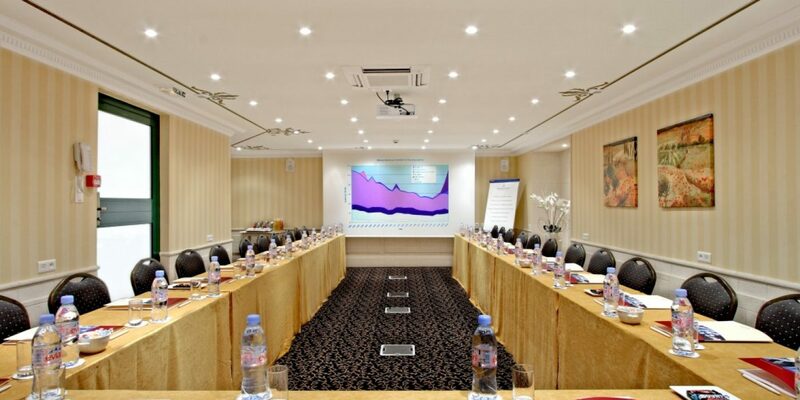 U shaped conference room : Conference room – scholar / Conference room – Theater / Conference room – Free Highspeed Wifi Internet.